The via Podiensis starts in Le Puy which has given its name to the route. The first French pilgrim was a bishop living in Le Puy who started the route in 950. Gentle rolling landscape of the Velay Mounts, pastures in Margeride Plateau, here is the region of Auvergne, the heart of France, a place with a rich History. Then the Saint James Way crosses the Aubrac Plateau, a rural and authentic area with wonderful scenery and charming villages to finally reach Conques, this marvellous medieval place unchanged for centuries. From Figeac follow the peaceful Cele Valley to Saint Cirq Lapopie and Cahors. Le Puy is a lively cultural medieval city surrounded by low mountains. Its old charming Centre with numerous museums, the famous 12th century Cathedral forms the highest point of the city, the 10th century cloister, and the iron statue of Notre-Dame de France (The Virgin Mary) overlooking the town . If you arrive early take the time to walk through the old city and visit all these renowned places. Dinner and night in a 3 star hotel. 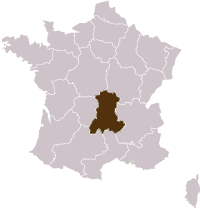 Le Puy-en-Velay to Saugues. 44 km (27.3 miles) +600/+900 m. Notre Dame du Puy Cathedral is the departure point for you just as thousands of pilgrims before. Today's ride crosses the green mountain of the Velay massif with stunning sceneries to Saint Privat d’Allier and continues from the canyon of the Allier River up to the Gevaudan plateau and Saugues. Dinner and night at the hotel in the lively village of Saugues. Aumont Aubrac – Estaing 68 km (42 miles) From Aumont ride up to Nasbinals and make a stop at the 12th century granite Church then from the Aubrac Pass go on to Saint Chelly and start the descent into the green Lot Valley with Saint Come d’Olt (among “the most beautiful villages of France “) and the little town of Espalion from where you follow the river up to fairy tale-like perched castle in Estaing where you will spend the night and have dinner. Estaing - Conques 36km (22 miles) – Quit Estaing (+320 m) up to Golinhac (+649 m) and crosses many hamlets to reach the green jewel case where Conques is nestled for so many centuries as if nothing had changed since the medieval time. This short stage gives you the time to visit this exceptional place : Conques is one of the nicest places of the via Podiensis and is considered a jewel with its three tower basilica standing out of the pointed roofs. The Portal is an unforgettable real Roman treasure. Visit Ste Foy Abbey and the cloister and enjoy the narrow streets of this gem. Dinner and night in Conques. Trip ends after breakfast in Cahors. Locks, REPAIR KIT, saddle bags, helmet. 2 and 3 star hotels. En suite bathrooms. A road book in English with the description of your program and a map. The trip to the start and from the end of your tour. Access : Le Puy en Velay : train via Lyon - Cahors train station.